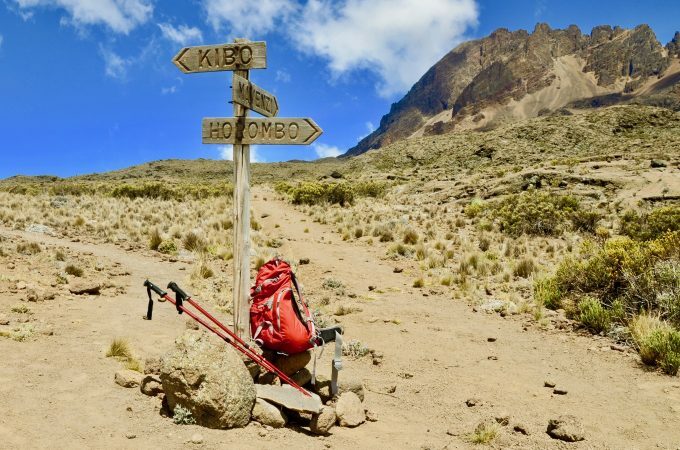 Marangu Route, also called “Coca-Cola Route”, is one of the most famous and popular routes top the top of Kilimanjaro. 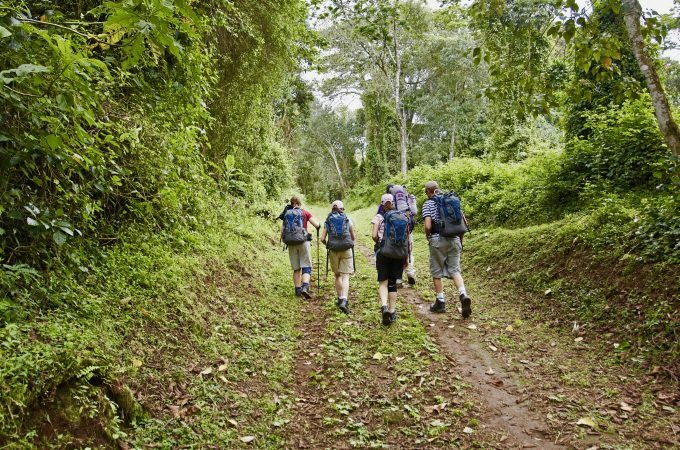 Marangu Route is considered to be one of the easiest routes to walk, as one moves a lot on well-developed paths. In contrast to other routes, it is the only route with accommodation in huts. You can choose between a shorter (5 days) and longer (6 days) ascent. 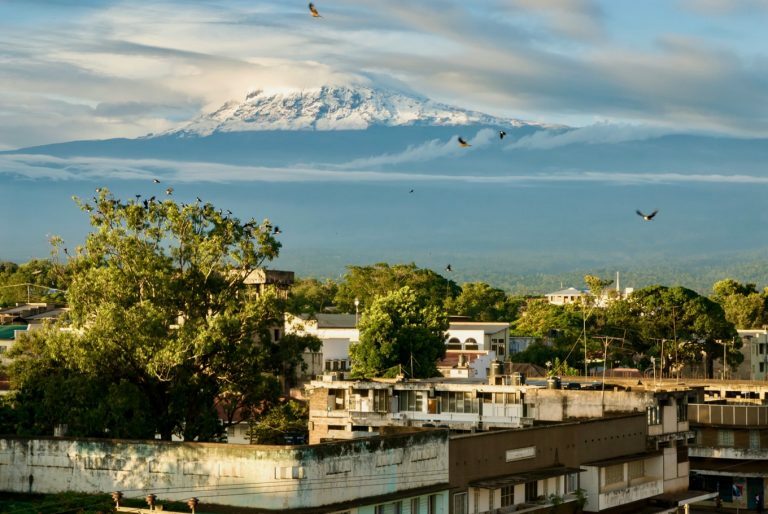 You will spend a total of 7 or 8 days in Tanzania, respectively. 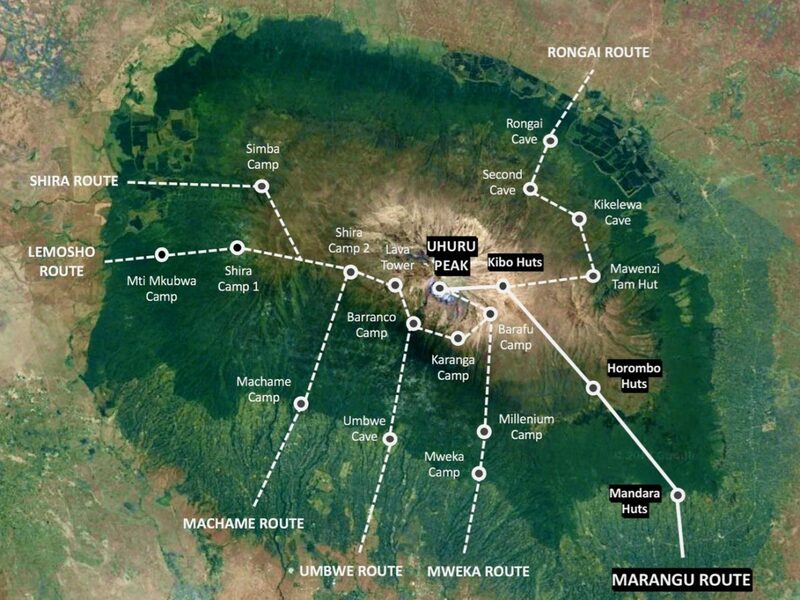 With us you can book Marangu Route starting at 1,530 USD per person. For an individual offer simply send us your request. During the ascent, the Marangu Route offers excellent views of the surrounding mountains and the Kibo itself. Due to the different vegetation zones that are crossed, it is also very scenic. You take the same route for ascent and descent. Overnight stays are in huts, which are equipped with simple beds and offer place for up to 10 people. All campsites are in direct radio contact with the management of the national park. The number of visitors on this route is comparatively high. Welcome to Tanzania! Upon arrival at Kilimanjaro International Airport, you will be welcomed by your driver and tour guide. Together you drive in the direction of Moshi (about 25 minutes drive). Only a few kilometers outside the city center, amidst plantations with a great view of the country, you will find Honey Badger Lodge where you are already expected by your hosts. Upon arrival at the lodge, a detailed briefing and equipment check will be held, i.e. 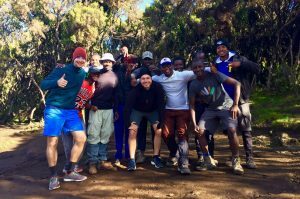 you get important information for climbing Kilimanjaro during the upcoming days. The afternoon is at your free disposal and can be used, for example, to explore the place or relax by the pool. Dinner takes place at the lodge, but can optionally be placed at another location (own organization necessary). After a big breakfast at your lodge, your guide picks you up. He checks the luggage once more before you drive together to Marangu Gate, the southeastern entrance of Kilimanjaro National Park. Luggage not required during the climb can be stored at the lodge free of charge. For an overview of the topic “luggage on Mount Kilimanjaro” look here or here. 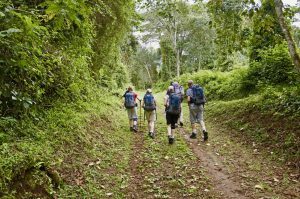 The last few kilometers of your journey run along the slopes of Kilimanjaro and through the small village of Marangu. After a good hour’s drive, you will reach Marangu Gate. Upon arrival, you will be registered by your guide in the national park. In addition, final preparations are made, such as baggage loading. You then start the first leg on the mountain. It leads on paths through dense rainforest. You will discover a variety of plant species and, if you are lucky, see colobus monkeys high up in the canopy. During the hike you take short breaks from time to time. After about 3-4 hours you will reach the first camp of your trip, the Mandara Huts. The remaining time until dinner is at your free disposal. After dinner, your guide will give you tips regarding clothing for the night as well as regarding clothes to wear and day luggage to pack for the day ahead. 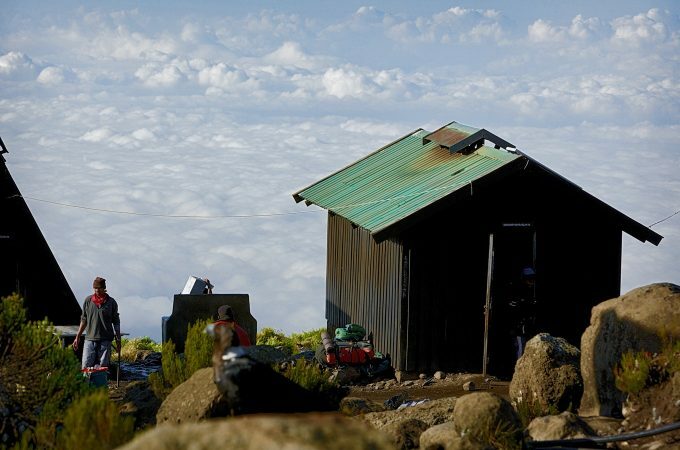 At around 9 pm the first day at Kilimanjaro ends and you spend the first night in mountain huts. Your day begins with a big breakfast, weather permitting, outside your tent. Between 8.30 to 9.00 am your hike will start in the direction of the Horombo Huts. At the beginning of today’s stage, you still walk through dense mountain rainforest. After a short while, however, the forest begins to thin out. You have arrived at the edge of the heathland and moorland. Your hike will take you along Maundi crater towards Kibo. Especially after leaving the mountain rainforest, you have great views of the summit region of Kibo and Mount Mawenzi, the latter located east of Mount Kilimanjaro. In addition, you will discover impressive plants such as lobelia and the sometimes meter high and centuries-old crested trees (Senecia). 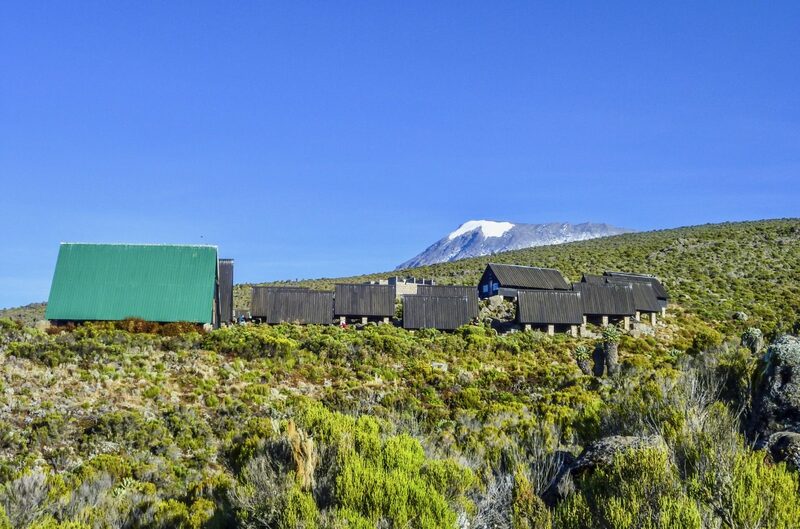 In the afternoon you reach the Horombo Huts, where you spend your second night in mountain huts. Your third day on the mountain is dedicated to adapting to the height. From your camp, you will walk to the so-called Zebra Rocks, located at 4,000 meters. 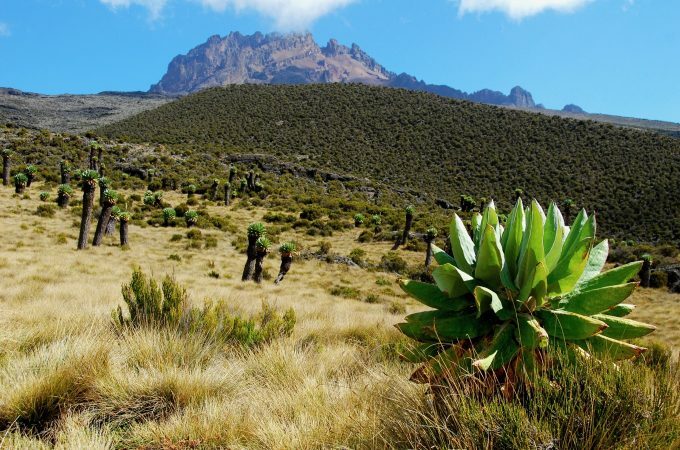 Depending on your condition, you can also continue to Mawenzi Saddle, which is located at about 4,300 meters. Your hike leads through moorland and heathland. In the higher regions, however, the landscape is increasingly alpine and sparse. In clear weather you have great views. After a total of 4 to 5 hours you will return to the Horombo Huts. Like the day before, you spend your night in this camp and thus the third night in mountain huts. Today’s hike starts as usual after breakfast. 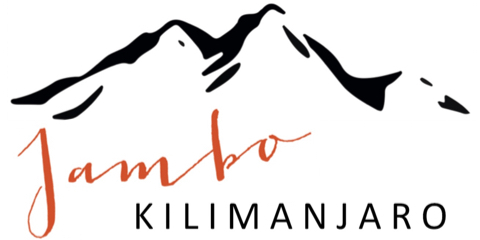 Your goal: the Kibo Huts, Base Camp! You walk over well-trodden paths across the alpine plateau. The path is lined with huge boulders of volcanic origin. This part of the ascent is sometimes quite rocky and more demanding to walk than the parts of previous days. During the hike you always have a great view of the summit of Kibo, Uhuru Peak. You pass the “Last Water Point”, where the porters draw water for the last time. Thereafter, there are no more water sources due to the altitude. Today you are having an early dinner as you start the summit climb in the middle of the night. Try to get some rest and sleep before. In this camp you spend your fourth night in mountain huts. The big day has come, summit day! 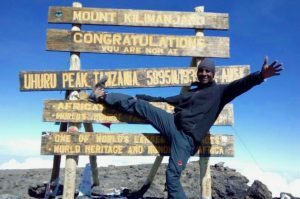 Already around midnight you start your hike up to the highest point of Africa, Uhuru Peak. Before the ascent begins, you get to eat a small meal. 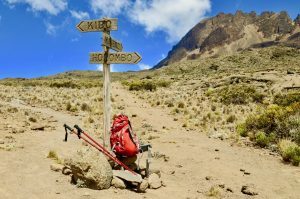 Thus, you are well prepared for the ascent to Uhuru Peak. A rocky path leads up the first passage to Hans Meyer Cave, located at about 5,200 meters. From there on you zigzag your way through the darkness and cold, over scree and stone up the mountain. It is an impressive hike under great starry skies, provided the view is clear. After about 5 hours you reach Gilman’s Point at an altitude of about 5,681 meters. Depending on your speed, you’ll see a glorious sunrise here or later at Uhuru Peak. From Gilman’s Point it is only about an hour’s walk along the crater rim to the summit. Once there, you can see the impressive glaciers of Kibo and enjoy the view. You made it! After a few minutes on the summit and great photos at the glacier you return to the base camp. There you have breakfast and then continue your hike to the Horombo Huts. After dinner, you spend your fifth and last night in huts on the mountain. The last day of your hike starts with a relaxed breakfast. Well-strengthened you then start the last stage of your hike, which still takes about six hours. For the last couple of hours before reaching the exit of the national park the path leads once more through lush green mountain rainforest. Before leaving the national park, the traditional farewell ceremony takes place. Once you arrive at Mweka Gate, your summit certificate will be issued, and you say goodbye to the mountain and your team. On the way back to your lodge, you optionally stop for a lunch with your guide. Once you arrive back at your accommodation – enjoy the shower! The rest of the day is at your disposal and can be spent alone or with your guide. Celebrate it the way you want, you deserve it! You’re spending the last night of your trip in your lodge in Moshi. After a good night’s sleep and a big breakfast, you check out of the lodge. If you have planned further activities, you continue your individual travel program accordingly. 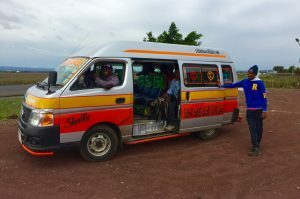 Alternatively, your driver and your guide will drive you to Kilimanjaro International Airport and you will start your journey home. For budget travelers: Stay at the More Than A Drop Hotel (or equivalent) on the day of arrival and departure and save up to 110 USD per person (simply select the appropriate option during your booking request). We plan each trip individually, according to your wishes. Send us your request for the Marangu Route online free of charge and without obligation. We will contact you with a personal offer. We are committed to more responsibility and sustainability in tourism. Therefore, we were awarded the TourCert Check and are part of the TourCert community! 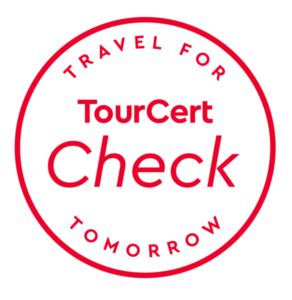 True to the motto “Travel for tomorrow” we develop our company from a sustainability perspective and can therefore associate ourselves with the TourCert Check.